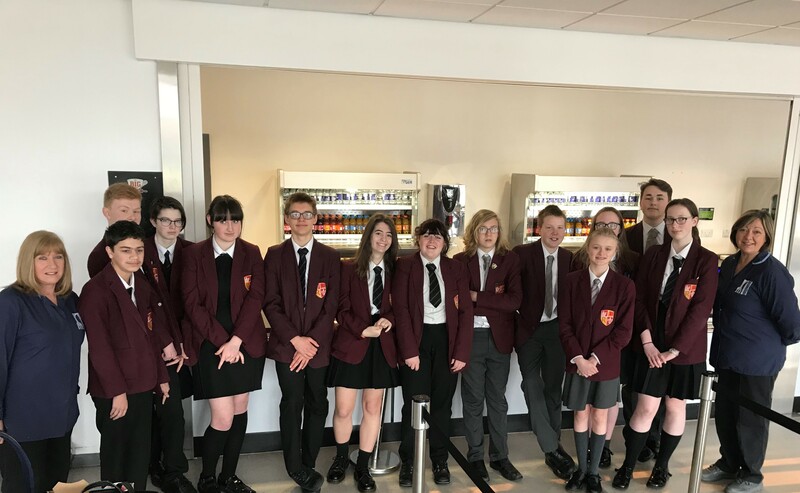 The proactive student council at Rainford High have been taking matters into their own hands when it comes to the canteen provision at their school. Andrew Ferguson, executive development chef at School Meals Service, St Helens, visited the school to meet with the council to discuss the current service and listen to students’ ideas on where it could be improved. Top of the agenda was how healthy options should be displayed more prominently to encourage students to opt for lunches and snacks that are better for them. The council suggested alternatives such as plain popcorn, raisins, melon and wholemeal toast should be on offer. They also proposed posters detailing the sugar, fat and calorie content for products should be put up around the canteen. Andrew Ferguson and students also discussed ways in which the school can reduce its food and plastic waste. Members of the council considered teaming up with local farmers to use the food waste for animal feed and other environmentally friendly agricultural needs. As Education Secretary, Damian Hinds, has urged all schools to stop using single-use plastic items by 2020, Andrew Ferguson told students that this is a priority and at present St Helens Council are considering all viable alternatives to support the government initiative. The student council suggested other smaller changes, for example, replacing cling film for foil in the canteen would significantly reduce plastic use. Thomas in Year 10, is part of the student council. He said: “Mr Ferguson’s visit was interesting and constructive as he elaborated upon all standards, giving detailed insight and information concerning the future healthy and sustainability targets set by St Helens Council. For more information, visit: www.rainford.org.uk.